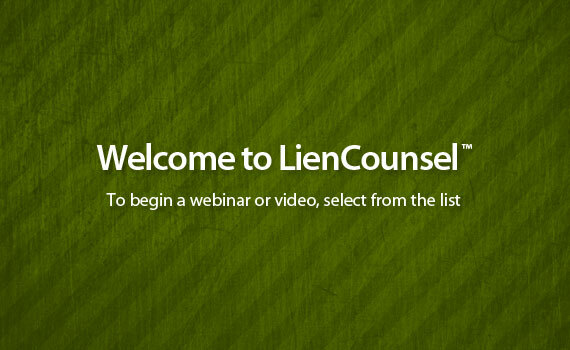 The Voice of Lien Law. What is a Notice of Retention? Who must file a Notice of Retention? What information must a Notice of Retention include? When must a Notice of Retention be filed? What happens if a Notice of Retention is not filed? Is a Notice of Retention required for private and public construction projects? Does more than one Notice of Retention have to be filed for each project? Who must file a Preliminary Notice? What information must a Preliminary Notice include? When must a Preliminary Notice be filed? What happens if a Preliminary Notice is not filed? Is a Preliminary Notice required for private and public construction projects? Does more than one Preliminary Notice have to be filed for each project? What is a Good Faith Estimate of Completion? Who may file a Good Faith Estimate of Completion? When must a Good Faith Estimate of Completion be filed? What is the effect of filing a Good Faith Estimate of Completion? Who can file a Notice of Commencement? What information must a Notice of Commencement contain? When must a Notice of Commencement be filed? What is the effect of failing to file the Notice of Commencement? Who may file a Notice of Completion? When can the Notice of Completion be filed? What is the effect of a Notice of Completion? What is a Notice of Intention to File a Notice of Completion? When is a Notice of Intention to File a Notice of Completion filed? Who can file a Notice of Intention to File a Notice of Completion? What is the effect of filing a Notice of Intention to File a Notice of Completion? Must a Notice of Intention to File a Notice of Completion be filed for all construction projects? What is a Construction Service Lien? Who may record a Construction Service Lien? What information must the Construction Service Lien contain? When must the Construction Service Lien be recorded? Where is the Construction Service Lien Recorded? Does a copy of the lien have to be to sent to anyone? May a single Construction Service Lien be used to lien more than one piece of property? Am I entitled to recover attorney fees or costs for preparing and recording a lien? After a Construction Service Lien is recorded, must any further action be taken to collect? After I have been paid do I have to release my lien? What is a Preconstruction Service Lien? Who may record a Preconstruction Service Lien? What information must the Preconstruction Service Lien Contain? When must the Preconstruction Service Lien be recorded? Where is the Preconstruction Service Lien recorded? Does a copy of the lien have to be sent to anyone? May a single Preconstruction Service Lien be used to lien more than one piece of property? After a Preconstruction Service Lien is recorded, must any further action be taken to collect? After I am paid do I have to release my lien? Who may make a claim on the bond? What must a Notice of Claim include? When must the Notice of Claim be sent? After the Notice of Claim, should I take any further action? What private projects are required to be bonded? Who may make a Request for Adequate Assurance? Who receives the Request for Adequate Assurance? How is the Request for Adequate Assurance Served? What is the effect of serving a Request for Adequate Assurance? Is there a deadline to respond to a Request for Adequate Assurance? If I do not receive a response to my Request for Adequate Assurance, can I do anything about it?